WE'VE GIVEN AWAY ALL SAMPLES. Obviously, people love Metamucil®! While we’ve run out of samples, don’t let this stop you from trying Metamucil and experiencing its multi-health benefits. Click here for our full product line-up and to see why Metamucil is different than other fiber supplements. 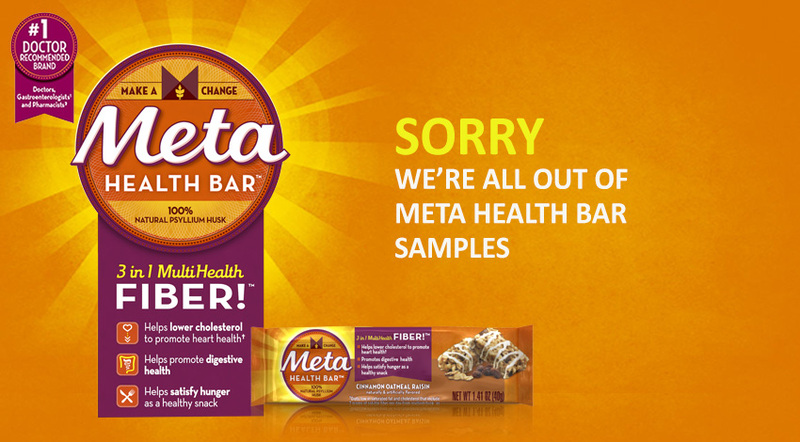 Follow Meta Health Bars for the latest product news, special offers and more! +Diets low in saturated fat and cholesterol that include 7 grams of soluble fiber per day from psyllium husk, as in Meta Health Bars, may reduce the risk of heart disease by lowering cholesterol. One Meta Health Bar has 1.8 grams of this soluble fiber. *While supplies last. Offer available in the US. Limit one sample per household or address. Allow 4-6 weeks for delivery. ©2014 Procter & Gamble. All Rights Reserved. All copy and claims valid only in the U.S. This website is intended for U.S. residents only.